A grid proposal consists of several contiguous, or nearly contiguous, observations. They may also sometimes be refered to as "raster" proposals. The pointings will not "line up" in a grid unless a roll or group constraint is applied. Note: Illustrations in this page only display the 4 ACIS-I chips. See the POG for more information about all available Chandra instrument configurations. An idealized survey layout is depicted below. 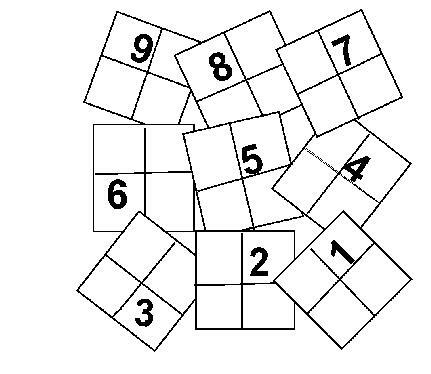 This survey consists of nine ACIS-I pointings in a 3x3 grid. 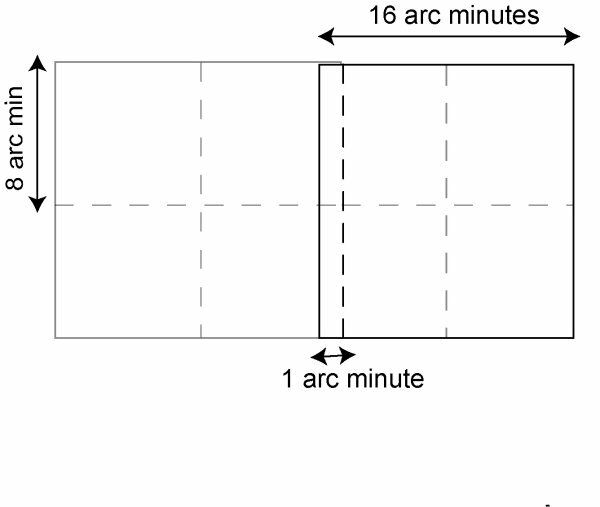 A schematic figure showing the layout of a 3x3 ACIS-I grid proposal. A "slew tax" of 1.5 ks is added to each observation at the Chandra Peer Review. This represents the average slew, settle and set-up time required for an observation. There can be no change in instrument configuration. Pointings will be assembled into one or more groups with a maximum of 90 ks per group, including slew tax. The slew tax for the first observation in a group will be 1.5 ks. Subsequent observations in the same group are charged at a rate of 0.5 ks. Programs which qualify for reduced slew tax also qualify for a reduced "time constrained count." Time constrained observations impact Chandra's observing efficiency. Short, closely spaced observations which can be scheduled as a group have less of an impact on Chandra's efficiency than the same observations spread over the sky. Note: a "group" for the purposes of determining slew are not the same as proposer-requested groups. Consider a survey with 20 pointings each of 5 ks. Please note that grid programs are unconstrained unless the proposer specifically requests a constraint. If the proposer requests a constraint, the groups for calculating the constraint values are defined the same as for slew tax calculations. The observations in a grid are NOT automatically constrained. In practical terms, this means that that they may scheduled at any time during the cycle. Since the nominal roll of Chandra changes with time, the roll angle of each observation may be different. If a proposer does not request any constraints, THE ROLL ANGLES WILL NOT LINE UP, as illustrated in the following figure. This will most likely lead to gaps in the sky coverage. What a grid observation may look like without a roll constraint. It is often most efficient to place several pointings from a survey contiguously in the observing schedule (this minimizes slew time). The number of such pointings that can be accommodated before slewing to a different location on the sky is dependent on the pitch angle of the survey observations. The most likely outcome for a survey with many short pointings is for a group of them to be scheduled together, followed by additional groups at later dates, until the observations are complete. Observations within such a group will have essentially the same roll, but different groups will have different rolls. 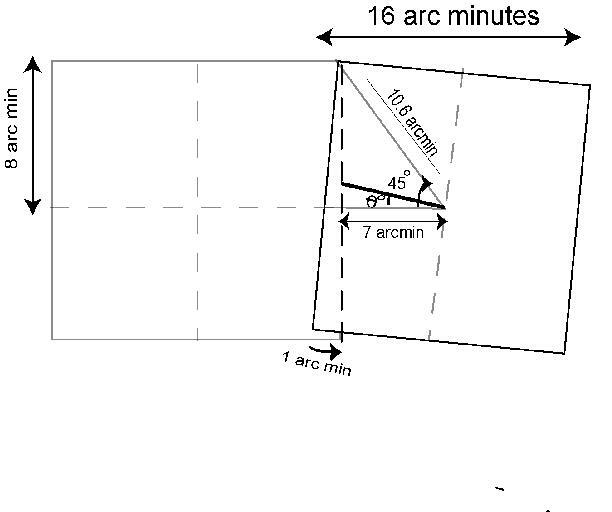 Impose a roll constraint (with associated tolerances) if the roll angle of the survey must be fixed. A group constraint should be used if the absolute value of the group constraint forces all the observations to be done within a certain time interval, but does not specify the exact window (e.g. all done within 30 consecutive days, but the 30 day period can start at any time during the cycle). The example illustration consists of nine 70 ks pointings in a 3x3 grid covering 0.6 square degrees where the absolute value of the roll is not important. It is important not to have gaps in the coverage. This is a case where a group constraint should be used, instead of a specific roll constraint. The maximum acceptable change in roll between two adjacent pointings is illustrated in the following figures. Two adjacent fields at zero roll angle. Note the overlap between the two chips. 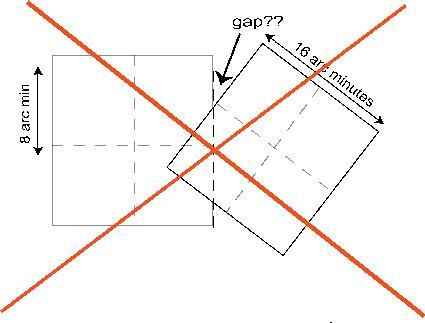 Two adjacent fields where the second field is rotated: this is NOT acceptable for our example because there is a gap. Two adjacent fields with maximum roll difference. Further rotation will create a gap. This geometry is correct if the overlap between two adjacent chips is small compared to the width of the chips (in this case the overlap is 1 arcmin and the ACIS-I chips are 16 arcmin on a side). Both Constraints and Slew Tax can be obtained with the "Constraints/Slew Tax" button in RPS once forms have been filled out. Keep reading for an example constraint calculation made without the RPS tool. The time interval for the example group is 8 days. The total duration of the observations is 70x9 = 630 ks or 7.3 days. The grading parameter then is 1.1. According to Table 5.1 of the Call for Proposals a group grade of 1.1 is considered "difficult". 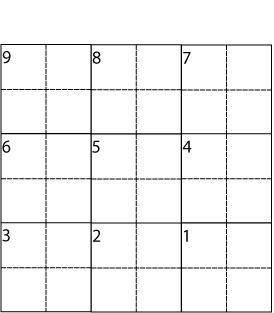 This particular example, which contains 9 observations, therefore counts as 9 Difficult observations. Please note that if the exposure time for each observation was 44 ks or less, the number of time constrained observations would be charged at a reduced rate, as described above. In the second scenario, CXC staff will contact PIs of successful grid proposals after the Peer Review to request their required list of target positions.